Tropical Storm Cindy, which has already curbed energy production in the Gulf of Mexico, disrupted shipping and forced workers off oil and gas platforms, is now dumping rain on the Gulf Coast. With top winds of 50 miles (80 kilometers) an hour, the system is moving northwest toward the coast and was about 105 miles south of Lake Charles, Louisiana, the U.S. National Hurricane Center said in a 11 p.m. New York time advisory. While Cindy wasn’t forecast to move across southeastern Texas or southwestern Louisiana until early Thursday, heavy rainfall was already affecting the northern Gulf Coast. The storm has shut one-sixth of the oil production in the Gulf of Mexico, halted vessel unloadings at a major oil-import terminal and triggered a force majeure on a system that collects natural gas from offshore platforms. Once Cindy makes landfall, it could threaten to disrupt even more energy operations in a region that accounts for about half of the nation’s oil-refining capacity. Cindy probably won’t have much impact on natural gas production because so much has shifted to other parts of the country, said Stephen Schork, president of the Schork Group Inc. in Villanova, Pennsylvania. Gulf rigs and platforms account for about 17 percent of U.S. crude oil output and 4.1 percent of gas production. About 45 percent of petroleum refining capacity and 51 percent of gas processing is along the coastline. Vessel offloadings at the Louisiana Offshore Oil Port marine terminal were suspended. The rest of the company’s operations, including deliveries from its Clovelly, Louisiana, hub, were expected to continue, according to the company’s website. While pilots have stopped guiding ships into Sabine Pass, which also funnels traffic to the ports of Beaumont and Port Arthur in Texas, the Coast Guard has decided to keep the Houston Ship Channel open. Sabine Pass is the site of the only active liquefied natural gas export terminal in the lower 48 states. Anadarko Petroleum Corp. shut in two fields in the Gulf, and BP Plc was diverting crude from its platforms to an alternative pipeline after the Cameron Highway Oil Pipeline System, known as CHOPS, was closed. Enbridge Inc. evacuated nonessential workers from some platforms in the Gulf. Royal Dutch Shell Plc suspended “some well operations” in the region, though production is unaffected, according to company spokesman Curtis Smith. BHP Billiton Ltd suspended nonessential operations and “demobilized” nonessential workers. The storm had shut in 17 percent of oil production and 10.1 million cubic feet a day of gas output in the Gulf of Mexico as of 11:30 a.m. local time Wednesday, according to the U.S. Bureau of Safety and Environmental Enforcement. The Destin natural gas line declared force majeure on Tuesday, saying in a notice to shippers that it’s unable to provide transportation from all offshore receipt points because of the storm. Gas output in the Gulf dropped to a six-week low, according to data compiled by Bloomberg. 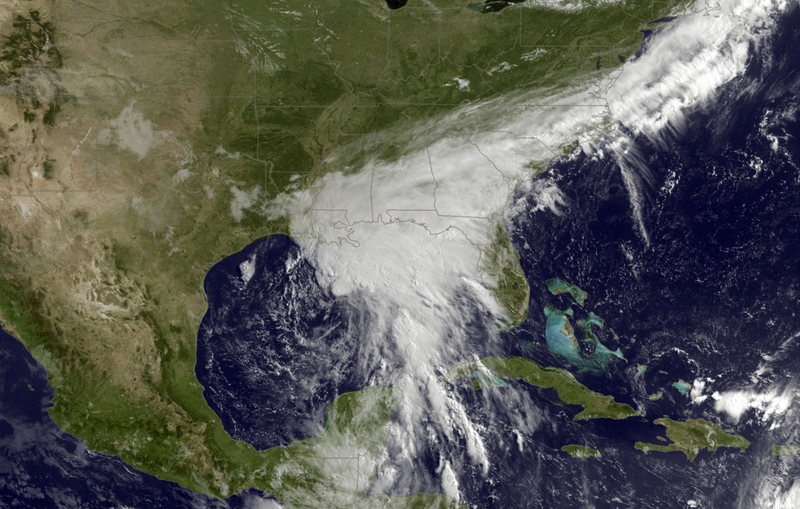 It’s been a year since the U.S. Gulf Coast took a storm hit. Tropical Storm Colin and Hurricane Hermine struck Florida last year. The last storm to reach the western Gulf was Tropical Storm Bill in June 2015. Cindy could bring 6 to 9 inches (15 to 23 centimeters) of rain across parts of Louisiana, Mississippi, Alabama and Florida, the center said.